A bath essence which is designed to warm the body, lift your emotions and aid healing after physical exercise. This is also a great foot bath, and if used regularly will reduce hardened skin. For a warming yet refreshing experience, Sage Purifying Bath Essence will warm you through and help heal and refresh your body after physical exercise. Soaking in a bath envelops the senses, relaxing body, mind and skin. The warmth opens pores allowing them to be thoroughly cleansed and stimulates circulation, encouraging cell renewal for healthy, clear skin. Sage is known for treating body acne, so this is the perfect treatment if you suffer with blemished skin on your body. 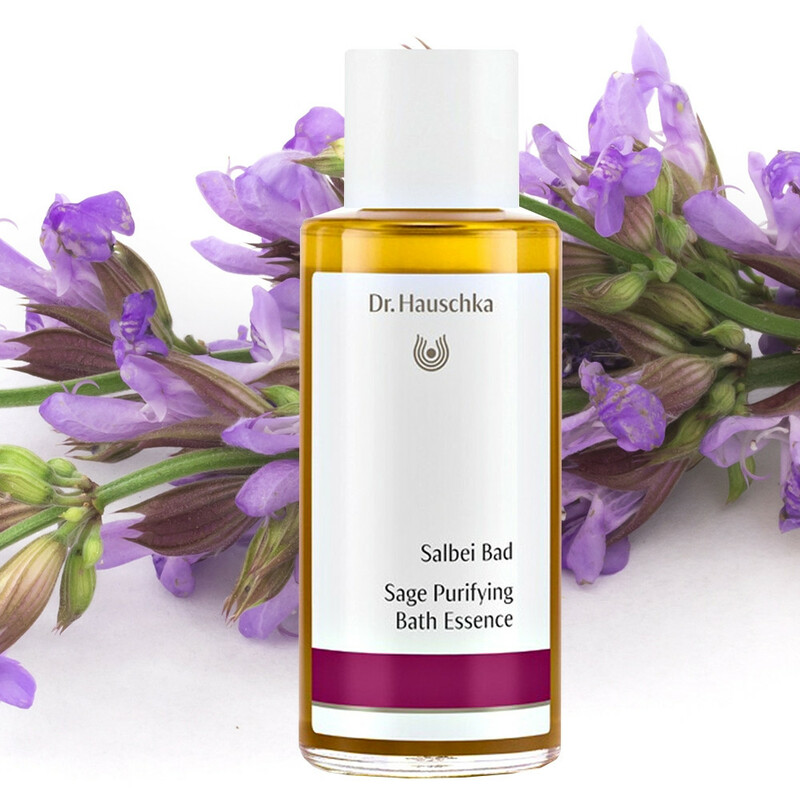 Sage Purifying Bath Essence can also be used as a foot bath to reduce swelling and help refresh and deodorise tired feet. Specially crafted with the best essential oils including Sage and Jojoba to aid healing and draw out impurities. The natural, non-toxic ingredients which make the basis for Organic skincare, are the best food for your skin – face and body – clearing away impurities and dirt without irritating even sensitive or dry skin. Application: For bath: Add 1-3 capfuls of Sage Purifying Bath Essence into the stream of running water as the bathtub fills. For foot baths: Add 1-2 caps of Sage Bath to comfortably hot (about 40°C) water. Ideally, soak feet twice a week for 10 to 15 minutes each time. Tip: Deodorising Foot Cream supports Sage Purifying Bath Essence. For extremely sweaty feet, Dr Hauschka also recommend using Silk Body Powder. Ingredients: Sulfated Castor Oil, Glycerin, Fragrance (Parfum)*, Salvia Officinalis (Sage) Oil, Limonene*, Linalool*, Geraniol*, Citronellol*, Citral*, Alcohol, Simmondsia Chinensis (Jojoba) Seed Oil.